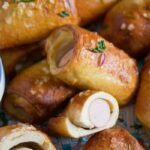 Easy pretzel dog recipe, hot dogs in homemade pretzel dough, perfect finger food for any kind of party. We love pretzels or Brezel in German, they are one of the bakery goods that I buy more often, except bread, of course. Salty, fluffy in the middle, chewier on the sides, eaten as they are, on the go or savored on a Sunday morning with a little butter smeared on top. Heaven! I don’t bake pretzels often, not because it is difficult, it really isn’t, but because you can buy pretzels at every bakery around here, they are always fresh and delicious and really not that expensive. They are large enough to satisfy you entirely, if you have one on the hand, you will not think about lunch for several hours. But although we love pretzels so much and we have them so often, I have never – until recently – seen anything like these pretzel hot dogs… They are definitely not something I could buy anywhere around here, I have only seen a recipe somewhere online and immediately thought it would be something my children would love. And they did love these pretzel hot dogs, my son ate 3 of them in a flash, dipping them in mustard and not even sitting down at the table. 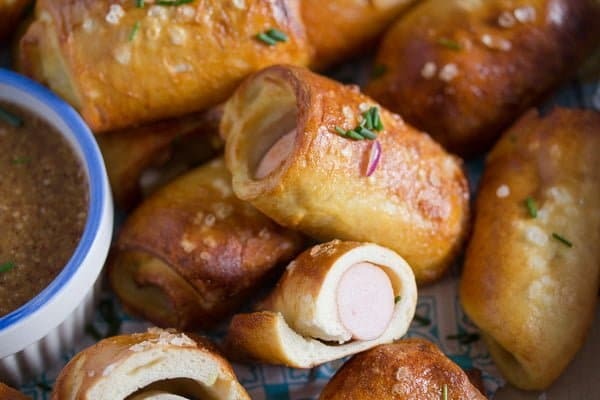 Another reason to post the recipe this week and another reason why I have chosen to bake this pretzel dog recipe is the Oktoberfest. 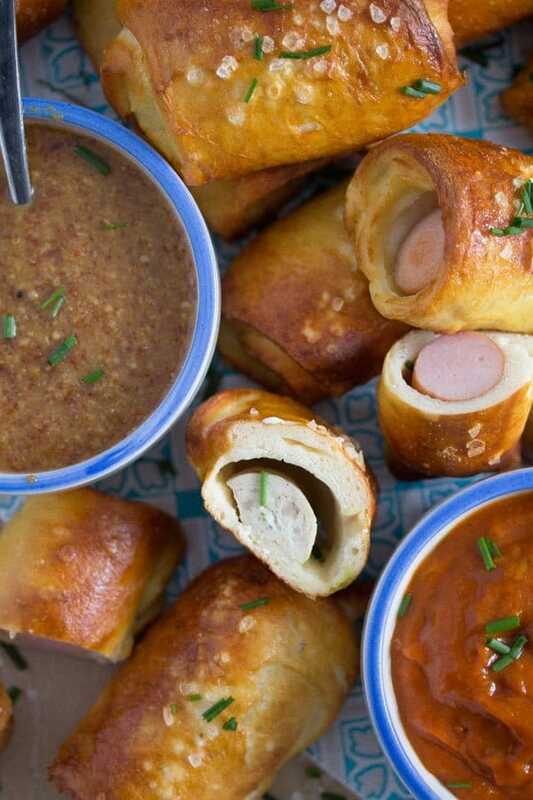 I thought that pretzel are so thoroughly German, so thoroughly Bavarian that the pretzel hot dogs would be the perfect fit for an Oktoberfest recipe. Not to mention the sausages I have used, whatever you call them – frankfurters or wieners – they also have German origins. And I have filled half my pretzel hot dogs with Weisswurst or white sausage, which are a Bavarian veal sausage specialty, that I only eat when in Munich or maybe once a year during this Oktoberfest time, when you can buy them just about anywhere. But of course, you don’t have to use weisswurst for this pretzel dog recipe, I suppose it would not be easy to find it outside Germany. Hot dogs or frankfurters or wiener sausages would be perfect. Or cocktail sausages, they even have the right size, so you will not have to cut them anymore. The recipe for pretzel dough is actually very easy, especially if you are using a kitchen machine to knead the dough. However, this pretzel dough recipe is easy to make even without a machine. Step 1: Mix together the flour, salt and the active dry yeast. Step 2: Heat the milk and the sugar very gently, it should have about 36 degrees Celsius/ 96.8 degrees Fahrenheit, so body temperature. Step 3: Give the milk to the flour mixture and knead. Step 4: Let the pretzel dough rise for about 45 minutes, it should double in size. Step 5: Knead again very shortly and use as desired. You can knead the dough with the hand held mixer fitted with dough hooks or you can knead the dough for a couple of minutes in a kitchen machine fitted with dough hooks. If you knead the dough by hand, you should do it for about 4-5 minutes. This pretzel dough recipe is not only suitable to make the pretzel hot dogs, but also for making regular pretzels or pretzel buns. If you want to make pretzels, form 5-6 pretzels (double the recipe for about 10-12 pretzels) and give them to the boiling solution (water and bicarbonate of soda) for about 30 seconds. Remove with a slotted spoon, shake to drain the excess water and place on baking sheets lined with baking paper. Let air dry shortly, brush the pretzels with beaten egg and sprinkle with coarse sea salt. Bake for about 25-30 minutes at 180 degrees Celsius/ 360 degrees Fahrenheit. If you want to make buns use the same procedure after forming the buns. As mentioned above I filled half of my pretzel dogs with hot dog sausages and half of them with Bavarian weisswurst. I had to cut the hot dogs in three pieces that would fit into the pretzel dough rectangles. When making the pretzel dogs with weisswurst, start by removing the peel of the weisswurst. Half the weisswurst horizontally and cut the halves in two pieces vertically as well. In the end you will have 4 pieces out of one weisswurst. After the dough has doubled in size, knead it shortly on a floured surface. 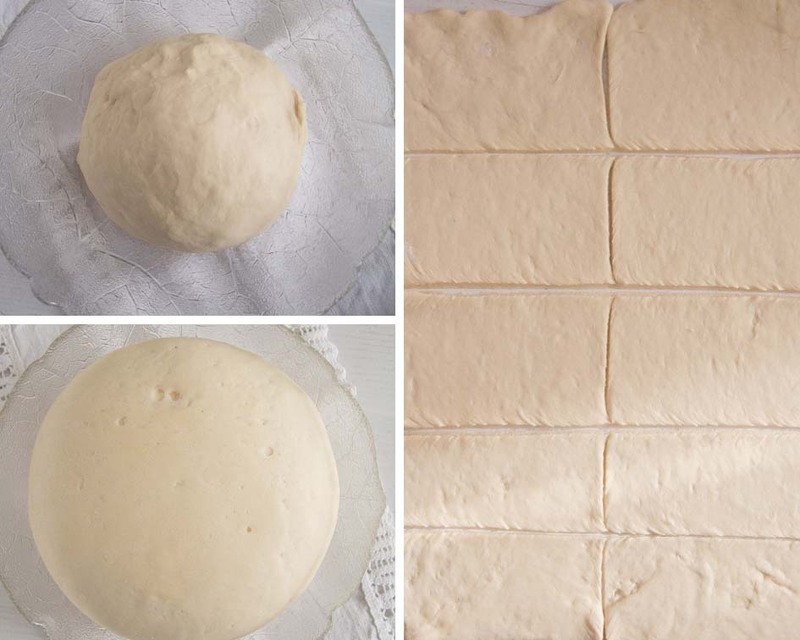 Roll the dough to a rectangle and cut it. Once vertically in half and then horizontally to obtain 12 smaller rectangles. Cut the edges of the dough all around to get some regular rectangles. 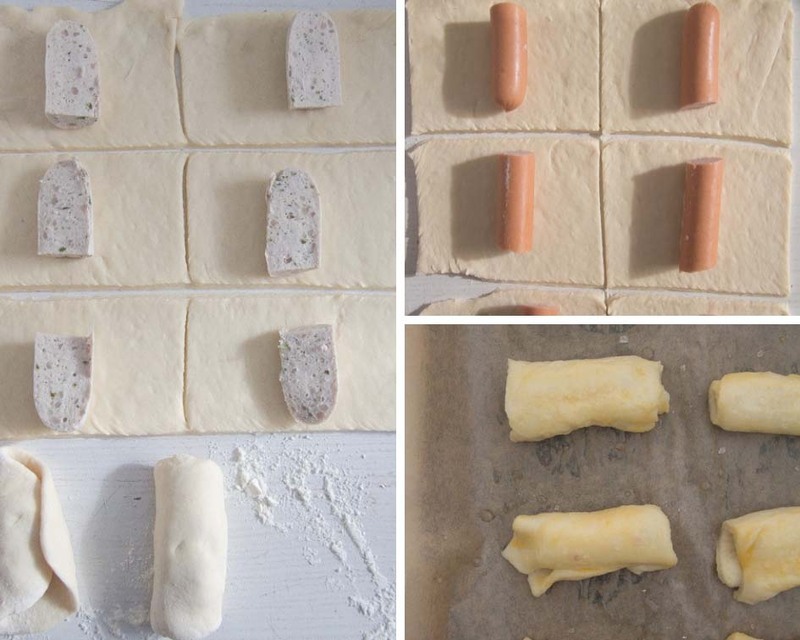 Place one piece of sausage in the middle of each rectangle and roll the dough around it. Use the dough scraps to roll and cut a few rectangles more, I had 3 or 4 smaller extras. Wrap a sausage piece in these extra pretzel dough rectangles as well. In the meantime bring 1,5 liter/ 50 fl.oz/ 6.3 cups water to a boil. Dissolve 3 tablespoons bicarbonate of soda in the water and let boil for about 3 minutes. Carefully give some of the pretzel hot dogs into the boiling water and let simmer for about 30 seconds. Remove from the water with a slotted spoon, shake shortly to remove the excess water an place the pretzel hot dogs on a baking tray lined with baking paper. Repeat with a second batch of pretzel hot dogs. Brush the pretzel bites with beaten egg and sprinkle with coarse sea salt. 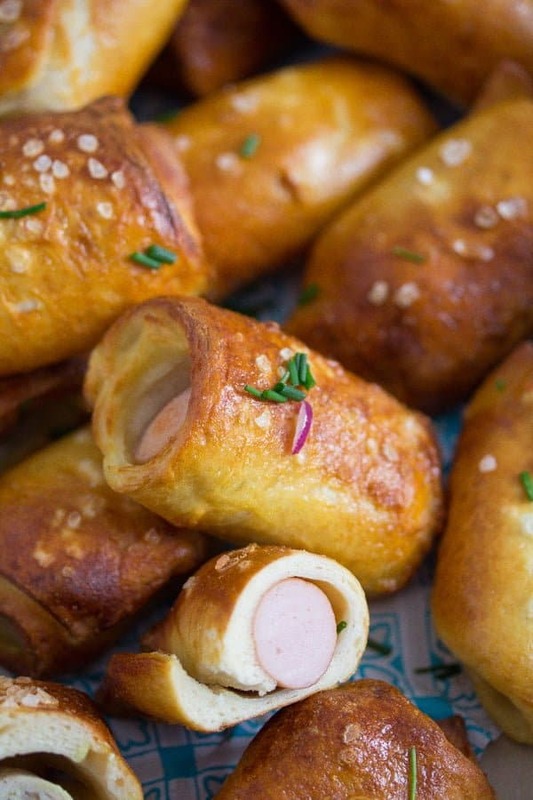 Bake the pretzel hot dogs for about 15 minutes or until golden brown and cooked through. Serve the pretzel hot dogs with sweet coarse mustard, the typical accompaniment for weisswurst or curry sauce/ curry ketchup. I prefer the pretzel dogs when still warm, but they are fine when cold as well. However, do reheat them in the oven before serving, if possible. Mix together the flour, salt and the active dry yeast. Heat the milk and the sugar very gently, it should have about 36 degrees Celsius/ 96.8 degrees Fahrenheit, so body temperature. Give the milk to the flour mixture and knead. You can knead the dough with the hand held mixer fitted with dough hooks or you can knead the dough for a couple of minutes in a kitchen machine fitted with dough hooks. If you knead the dough by hand, you should do it for about 4-5 minutes. Give the pretzel dough to a bowl and let rise for about 45 minutes in a warm place, it should double in size. While you form the pretzel hot dogs bring 1,5 liter/ 50 fl.oz/ 6.3 cups water to a boil. Dissolve 3 tablespoons bicarbonate of soda in the water and let boil for about 3 minutes. Cut the hot dogs in three pieces that would fit into the pretzel dough rectangles. When making the pretzel dogs with weisswurst, start by removing the peel of the weisswurst. Half the weisswurst horizontally and cut the halves in two vertically as well. In the end you will have 4 pieces out of one weisswurst. Bake the pretzel hot dogs for about 15 to 20 minutes or until golden brown and cooked through. 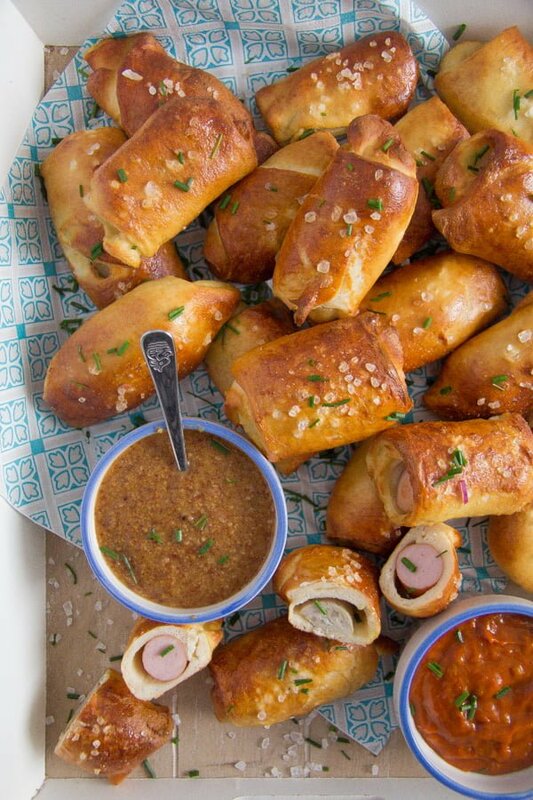 Note 3: You could also use bought pizza dough to make the pretzel hot dogs. Unroll that and cut it into 12 rectangles or as many as you can get out of that amount of dough. Note 2: The recipe makes 12 pretzel hot dogs, however I had 3 or 4 smaller extras, which I formed out of the dough scraps leftover after rolling and cutting the pretzel dough. Note 3: You might need 1 extra sausage, to fill the pretzel dough scraps. The nutrition label calculated the calories for the pretzels containing wiener sausages. My kids would love these! And me as well! The pretzel looks so delicious and your step by step photos are very helpful. When we visited Germany, the first thing we had was the pretzel. Loved them! This is exactly the kind of food I consider dangerous: I could eat tons of it! 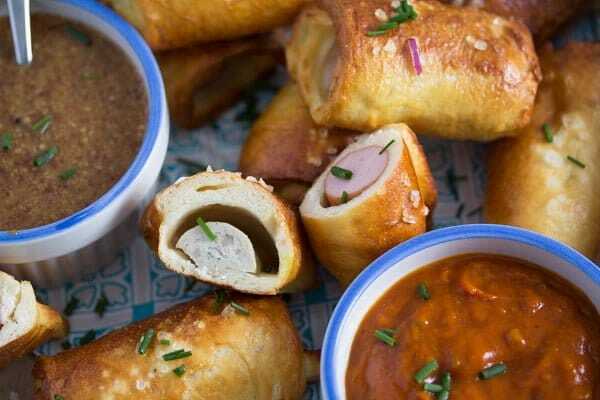 Seriously your pretzel dogs look fabulous! I love Wiener sausages and I love pretzels (we have a small shop at the train station and whenever I pass I cannot resist buying one… especially when it’s fresh and warm) but I would never think of combining both in such cute snacks. I’m working on a pretzel dog too, but I’m cheating with store bought dough. 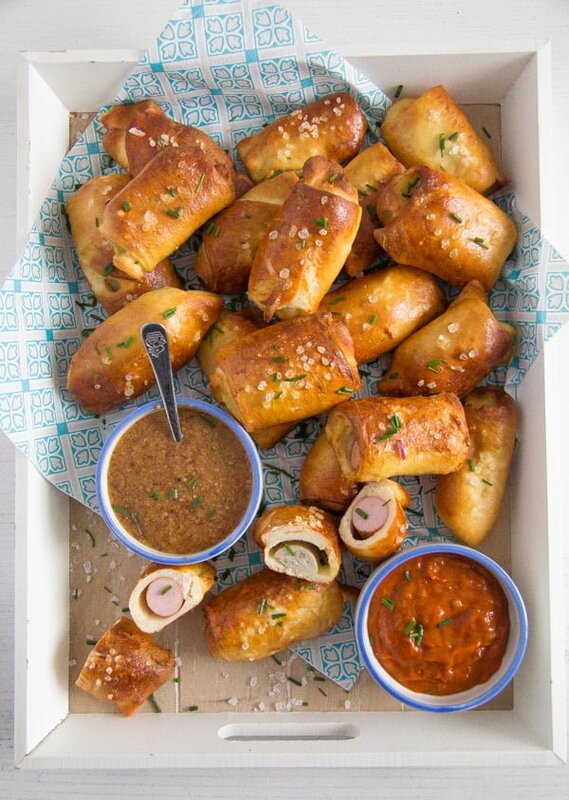 These look so good and pretzel look perfect!! They would fly off the plate at my house!